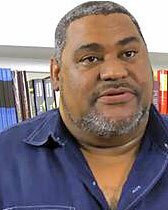 Chris Abani teaches Creative Writing (Fiction and Poetry) and Literature. He is a novelist, poet, essayist, screenwriter and playwright. His fields of interest include African Poetics, World Literature, 20th Century British and American Literature, African Presences in Medieval and Renaissance Cultural Spaces, The Architecture of Cities and their Potential Symbiotic Relationship with their Populations, West African Music, Postcolonial and Transnational Theory, Robotics and Consciousness, Yoruba and Igbo Philosophy and Religion. His prose includes The Secret History of Las Vegas (Penguin 2014), Song For Night (Akashic, 2007), The Virgin of Flames (Penguin, 2007), Becoming Abigail (Akashic, 2006), GraceLand (FSG, 2004), and Masters of the Board (Delta, 1985). His poetry collections are Sanctificum (Copper Canyon Press, 2010), There Are No Names for Red (Red Hen Press, 2010), Feed Me The Sun - Collected Long Poems (Peepal Tree Press, 2010) Hands Washing Water (Copper Canyon, 2006), Dog Woman (Red Hen, 2004), Daphne's Lot (Red Hen, 2003) and Kalakuta Republic (Saqi, 2001). He has also written numerous essays, articles, book reviews and critical papers on art, poetry, cities and literature for local and international journals, magazines and newspapers. His work has been translated into French, Italian, Spanish, German, Swedish, Romanian, Hebrew, Macedonian, Ukrainian, Portuguese, Dutch, Bosnian and Serbian. He holds a B.A. in English from Imo State University, Nigeria, an M.A. in Gender and Culture from Birkbeck College, University of London, an M.A. in English and a Ph.D. in Literature and Creative Writing from the University of Southern California. He is the recipient of an Edgar Prize from the Mystery Writers of America, PEN USA Freedom-to-Write Award, the Prince Claus Award, a Lannan Literary Fellowship, a California Book Award, a Hurston/Wright Legacy Award, a PEN Beyond the Margins Award, the PEN Hemingway Book Prize and a Guggenheim Award. Chris Abani has taught in numerous countries around the world including countries in sub Saharan Africa (Gambia, Nigeria and South Africa), the Middle East (Qatar), Central Asia (Thailand) and Europe (UK). He is always at work on multiple projects. Black Goat is an independent poetry series imprint created and curated by Chris Abani. It is affiliated with Akashic Books and is currently an imprint of that press. The vision behind Black Goat is simple: a commitment to publishing collections of poetry that might not otherwise find a home. Selected work will represent the finest examples of well-crafted and sometimes challenging poetry, and will also focus on experimental, aesthetically or thematically challenging work. The series also aims to create a proportional representation of African and other non-American as well as female poets on its list. Black Goat is currently on hiatus. The African Poetry Book Fund promotes and advances the development and publication of the poetic arts through its book series, contests, workshops, and seminars and through its collaborations with publishers, festivals, booking agents, colleges, universities, conferences and all other entities that share an interest in the poetic arts of Africa. The Fund is committed to seeking the resources to support this mission and to ensuring that all its efforts are carried out with excellence. The Fund will, through the Series and other projects, promote the writing and publication of African poetry through an international complex of additional collaborations and partnerships. The Fund and its partners will offer support for seminars, workshops and other publishing opportunities for African poets. The African Poetry Chapbook Anthology Boxset Series is one of the features of a new multi-pronged and dynamic initiative to promote the publication of African poetry with the aim of expanding the scope and reach of the poetry first in North America and the around the world. The African Poetry Book Fund is the umbrella organization over a series of projects with both developmental and enhancement objectives when it comes to African Poetry. The Chapbook Anthology Boxset is a box set of seven chapbooks featuring the poetry of seven dynamic African poets who have not yet published a full-length volume of poetry. Each chapbook includes a preface by a leading writer and the box set is introduced by co-editors, Kwame Dawes and Chris Abani. The initiative will partner with a press to publish a box set anthology once every two years of four novellas from new and established African writers to foreground this literature in the mainstream. A guest editor in the field will be invited to co-edit every time so as to maintain balance and a fresh perspective. The initiative will partner with other African Literature Initiatives (Brunel, UNL and Princeton) to work on the development of writing and publishing in Africa. Pushcart Nomination (poetry) for "A Way To Turn This To Light"